Puri Jagannath Ratha Yatra Festival 2016: The Ratha Yatra is the Hindu Festival, which is held at the Puri, Odisha, India. This grand festival is associated with the Lord Jagannath. The people of Puri and the surrounding people will ready to make this festival as grand. 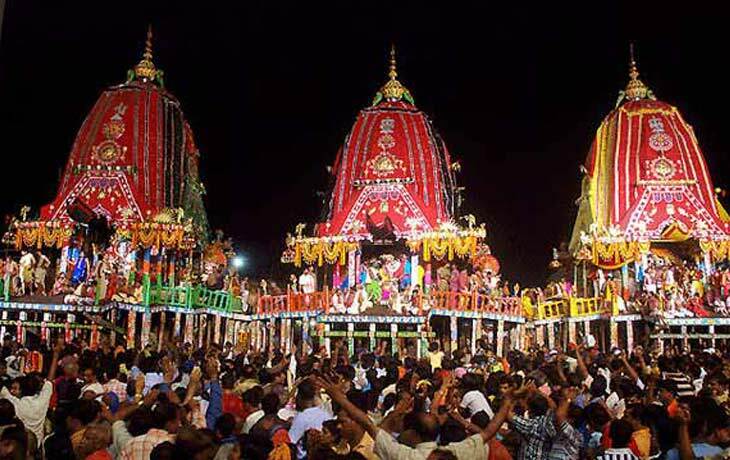 The Rath Yatra or Car Festival commences on the date of July 6th, 2016. The Bahuda Jatra or Return Car Festival will start on the 15th July 2016. The 45.6 feet height along with 18 wheels of Lord Jagannath’s chariot is called Nandighosh. The Balaram’s chariot Taladhvaja is the 45 feet high, and it has 16 wheels. The Subhadra’s chariot Devadalana has the height of 44.6 feet with 14 wheels. Scroll down and Watch Puri Jagannath Ratha Yatra 2016 Live Streaming, Rath Yatra Special Trains, Read Rath Yatra History. Many of the Indian and Foreign television channels will telecast this Ratha Yatra Festival 2016 as Live. Lots of devotees congregate at the location of Puri for Ratha Yatra 2016 from India and other countries also. The Government of India has arranged the Live streaming online via their website and the live telecast on their channel too. Visit the following website (http://rathjatra.nic.in/) that we provided on the button given below and watch the Festival as Live on July 6, 2016. The Rath Yatra Festival 2016 will webcast by National Informative Center (NIC). The Festival will also telecast on the DD National provided by Government of India. You can also watch this on YouTube Live streaming. One of the Sub-division of Indian Railway is the East Coast Railway (ECoR). It will arrange the special trains for this festival, Puri Rath Yatra 2016. Stay tuned for More updates. Share this Puri Jagannath Ratha Yatra Festival 2016 Live Streaming and Special Trains to your Friends and Relations.